Industrial process control valves are available in uncountable combinations of materials, types, and configurations. An initial step of the selection procedure for a valve application should be choosing the valve type, thus narrowing the selection field to a more manageable level. Valve "types" can generally be classified by the closing mechanism of the valve. 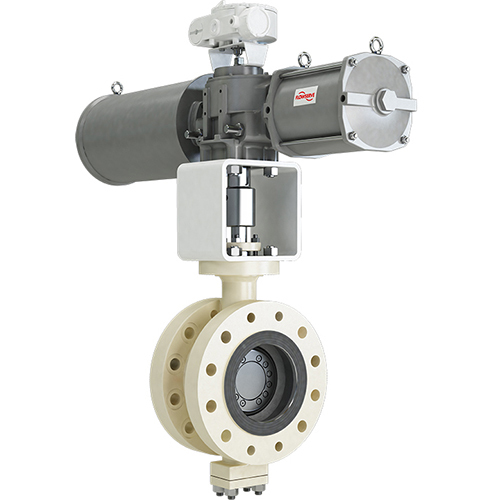 A butterfly valve is used for stopping or controlling flow of liquids or materials through pipes. The "butterfly" refers to the round, flat disk that allows for flow through the valve. Butterfly valves are a member of the "quarter-turn" valve family, meaning fully open to fully closed in 90 degrees rotation. 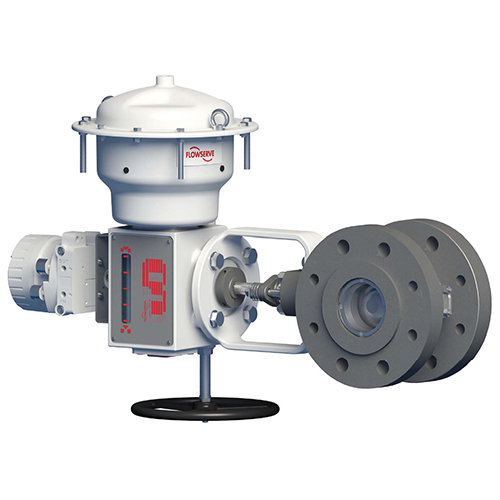 They are opened and closed via a lever, manual gear operator, pneumatic actuator, or electric actuator. 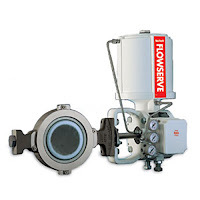 Butterfly valves can be used for on-off service and some varieties are used as control valves. Butterfly valves are generally less expensive than other high flow valves, lighter in weight, and take up less piping length. Since the disk is always in the flow path, butterfly valves always have a pressure drop across the valve. So called "rubber lined" butterfly valves (resilient seated) which are best suited for lower pressure, lower temperature, general purpose applications. High Performance Butterfly Valves (HPBV) which are designed to ANSI pressure classifications and are suited for more robust industrial applications. Rubber lined (resilient seated) butterfly valves come in a variety of seating materials, where the disk "jams" in to the seat. This provides a tight closure, but also causes wear on the seat. Seat replacement is part of normal maintenance on these valves. 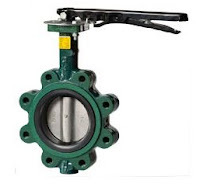 Another characteristic of rubber lined butterfly valves are higher starting and ending torques due to the "jamming" and "unjamming" of the disk in the seat. 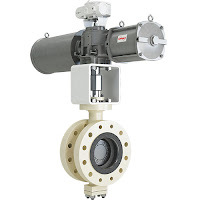 High performance butterfly valves have precision machined teflon, or metal seats, and are slightly offset as to lessen the amount of seat-to-disk interference. The disc still is pushed against he seat, but in a much more controlled and measured manner. Seat wear is still an issue, but not like rubber lined valves. Seating and unseating torque effects are much less as well. A variation of the HPBV is the triple eccentric butterfly valve which uses a metal seat and a "triple-offset" design, best described as the disk coming "off and away" from the seat. This assures that the disk only contacts the seat at time of full closure, reducing wear on the metal seat. These valves provide excellent shut off in critical applications. Wafer body, whereby the valve is "sandwiched" and held in place between two pipe flanges and are suitable for lower pressure applications. Lug style bodies that have threaded "lugs" cast in to the body of the valve and bolts are used to secure the valve for end of line service or keeping the valve in place when the piping is disassembled. ASME flanged butterfly valves where the valve body is in-between two ASME flanges. Butterfly valves, like other valve types, have applications where selection and design of one style outperforms another style. Careful consideration and consultation with a valve expert is a first step toward making a good selection. Combine your process know-how with the product application expertise of a professional sales engineer to produce the best solutions to your process control challenges. Unlike other renewable energy sources, biomass can be converted directly into liquid fuels, called "biofuels," to help meet transportation fuel needs. The two most common types of biofuels in use today are ethanol and biodiesel. Ethanol is an alcohol, the same as in beer and wine (although ethanol used as a fuel is modified to make it undrinkable). It is most commonly made by fermenting any biomass high in carbohydrates through a process similar to beer brewing. Today, ethanol is made from starches and sugars, but scientists are developing technology to allow it to be made from cellulose and hemicellulose, the fibrous material that makes up the bulk of most plant matter. Ethanol can also be produced by a process called gasification. Gasification systems use high temperatures and a low-oxygen environment to convert biomass into synthesis gas, a mixture of hydrogen and carbon monoxide. The synthesis gas, or "syngas," can then be chemically converted into ethanol and other fuels. Ethanol is mostly used as blending agent with gasoline to increase octane and cut down carbon monoxide and other smog-causing emissions. Some vehicles, called Flexible Fuel Vehicles, are designed to run on E85, an alternative fuel with much higher ethanol content than regular gasoline. Biodiesel is made by combining alcohol (usually methanol) with vegetable oil, animal fat, or recycled cooking grease. It can be used as an additive (typically 20%) to reduce vehicle emissions or in its pure form as a renewable alternative fuel for diesel engines. Research into the production of liquid transportation fuels from microscopic algae, or microalgae, is reemerging. These microorganisms use the sun's energy to combine carbon dioxide with water to create biomass more efficiently and rapidly than terrestrial plants. Oil-rich microalgae strains are capable of producing the feedstock for a number of transportation fuels—biodiesel, "green" diesel and gasoline, and jet fuel—while mitigating the effects of carbon dioxide released from sources such as power plants. Swanson Flo, and its subsidiary BioFuels Automation, has decades of experience in the renewable fuels industry. Their team is responsible for the products in over 90% of plants nationwide and are uniquely positioned to keep the existing bio-refineries operational while minimizing downtime. For more information about the processing of renewable fuels, contact Swanson Flo by calling 800-288-7926 or visiting https://www.swansonflo.com.